This past week I made a discovery while checking decade-old back-up DVDs: Not all the 2005-06 wild bunny photos shot in my Kensington, Md. backyard are lost. It’s an incomplete set, and the best images are still missing; presumed gone forever. On the afternoon of June 10, 2005, I stepped out onto the deck overlooking the backyard and spotted a young rabbit in the grass. I fetched the Nikon D70 mounted with Nikkor 70mm-300mm lens and started shooting. 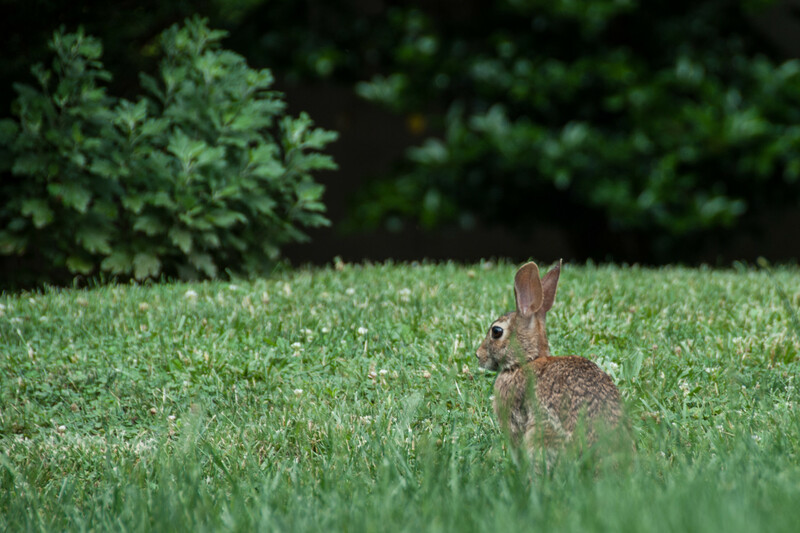 I worked my way down the stairs onto the grass and slowly approached the rabbit, closing quite the distance before it cautiously moved away. Sometime later, a friend and I traded some gear, which put my Apple PowerBook in his possession. The Pictures folder appeared on the backup disk but when I checked later, after the Mac was wiped, no photos had transferred. The photo loss was a gut punch. I was a busy shooter that summer, using the Nikon D70, which still ranks among my favorite all-time digital SLRs. Who says 5 megapixels isn’t enough? The digicam shoots super sharp pics and delivers color and contrast like the eye sees. Three-and-a-half months later, in post “Backyard Bunny“, I expressed excitement for finding lower-resolution renders of the two best pics. They’re better than nothing. The newly discovered treasures are original RAWs. Wow. But they are from a year later: June 25, 2006. On the 4th of the same month, I buried baby bunny Bubba in the backyard. I found more photos of him, too, and I shared them one week ago. There likely would have been no bunnies to see or shoot if not for the best investment we ever made for our home: push-mower. Not long after we scrapped the noisy power grass-cutter, we started seeing more animals and insects in the backyard. My June 14, 2004 post about Luna moths (and March 30, 2015 followup with photo gallery) is good example—and the push-mower is visible, too. I don’t recall shooting the second, recovered set of bunny photos. I used the Nikon D200, a camera not beloved like the D70. But a satisfactory shooter, still. (Sometimes more is less.) For the featured photo, vitals: f/5.6, ISO 100, 1/80 sec, 200mm.